An advanced western army invades a Middle Eastern country and soon vanquishes the corrupt ruling regime and its army. This army then tries to bring about democracy, liberty, and economic change. But the populace, whipped into a frenzy by the entrenched political power brokers, unites to rebel against the invaders who are soon forced to leave as other strategic challenges arise. Although this may sound like the U.S. in Iraq after 2003, the author is actually describing Napoleon’s invasion of Egypt in 1798 and his destruction of nearly 400 years of Mameluke rule in Egypt. Like the Americans over 200 years later, the French hoped to bring liberty, equality, and fraternity to a Middle Eastern country, only to be turned away several years later with the elite still in power in Egypt. 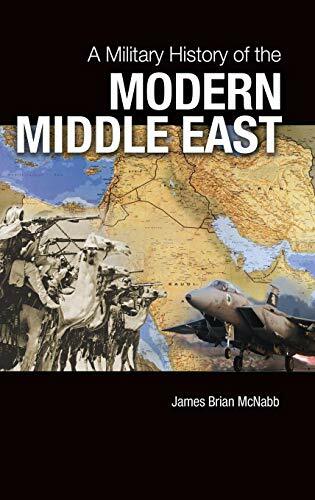 This concise yet sweeping history of warfare in the Middle East from 1798 to present is an excellent introductory volume to understanding how geography, culture, religion, politics, and economics have combined to create a unique blend of conflict in this region. Although Napoleon’s invasion of Egypt may seem like a strange place to begin his study, the author provides a brief but comprehensive introduction to the unique style of tribal raiding warfare that remains a hallmark of Middle Eastern conflict and moves quickly to the most important conflict to understand the current issues in the Middle East, World War I. The chapters on World War I and its aftermath are the highlight of this book. Understanding the backroom deals, double crosses, and outright deceptions conducted by Britain and France as they carved up the remains of the Ottoman Empire are critical to understanding the genesis of most of today’s conflicts in the region. The author does a truly remarkable job of detailing both the immediate and downstream effects of the Sykes-Picot Treaty, the Balfour Declaration, and myriad other treaties and deals that broke up the Ottoman Empire and ushered in modern Turkey, Iraq, Syria, Lebanon, and Israel—all hot spots of ethnic and religious strife. The utter ignorance and/or willful disregard of British and French leaders to the tribal, ethnic, and religious groups in the region lead to the artificial boundaries of made up countries to satisfy colonial ambitions which left festering grievances of groups such as the Armenians and Kurds that still resonate today. The author does a remarkable job of covering a vast amount of material in sufficient detail to provide a solid understanding of events without getting too bogged down in details. Going beyond just a narrative history, McNabb provides context and analysis on a number of topics, including the impact of technology on Middle Eastern conflict, the role of superpower politics in the Cold War, and the continuing influence of religion, ethnic hatred, and tribalism on the seemingly never ending conflicts in the region. Other than a few annoying line editing errors and a couple of factual mistakes (the USS Kitty Hawk was not a nuclear powered aircraft carrier), this is a very solid introductory volume to understanding war and conflict in this turbulent region. Packing concise history with solid analysis, it is an excellent reference for anyone who wants an overview of how war has and continues to shape this region of the world.